The Barbell Pullover is an advance isolation movement that focuses on the stretching and development of the Latissimus Dorsi (lats). The lats are the part of the back that when developed flare out to give you that “V” taper that people strive for. 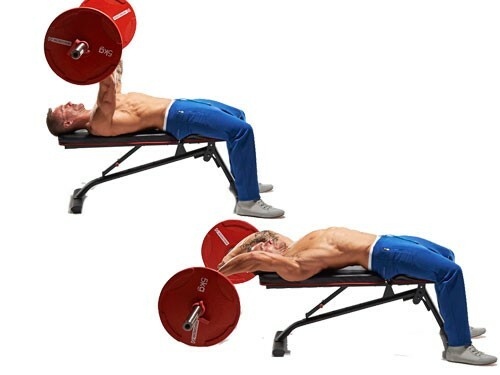 There are several variations to this advance movement that can be done to also employ the chest muscles as well. Lie on a bench, head over the end, with your feet flat on the floor. Grasp barbell from behind off the floor and position the barbell over chest with elbows bent slightly. With elbows bent slightly, the abs tight and the body stable. inhale and lower the bar over and beyond head until upper arm is approximately parallel to torso. While exhaling, pull bar back up using the same path. Inhale on the way down, exhale on the way up. 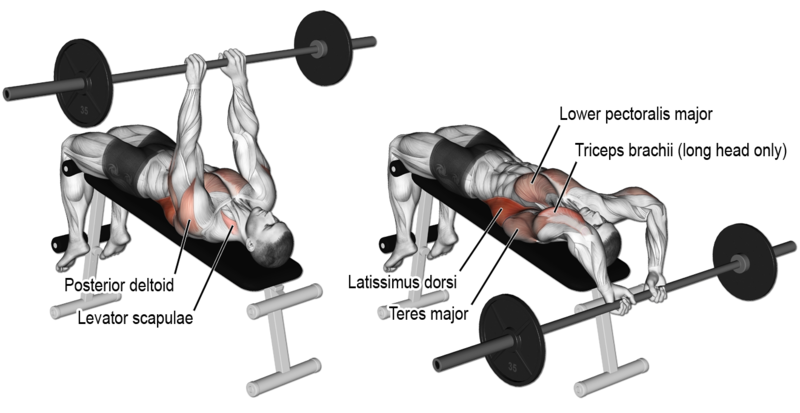 If you have any shoulder problems, be smart and just avoid the Barbell Pullover altogether. There are plenty of other exercises which deliver success without such risk. If you feel or have any shoulder pain while performing this exercise stop. Keep your elbows slightly bent and close to the body to keep the emphasis on your lats thereby preventing possible shoulder injury. Keep the abs tight and the body stable. A tight core will help prevent injury and give you added stability to engage the weight. Squeeze the Lats at the top of the movement to get maximum fibre recruitment and maximum muscle contraction. Using too much weight. A common mistake many novice lifters is having to arch your back to pull the weight up. Raising your head off the bench. This can cause a strain to your neck. Keep your head supported on the bench. Raising your hips. Raising the hips takes the weight resistance off the lats and diminishes the effectiveness of the exercise. The objective of the movement should be top keep your hips down and to get a good slow stretching before reversing the path and squeezing the lats at the top of the movement. Not keeping feet flat on floor or bench. Not keeping your feet flat on the floor can cause lower back injury or strain. Overstretching. This can lead to strains in the rib cage area ad also possible shoulder damage. Performing the movement too fast. Performing the movement too fast doesn’t allow you to fully recruit as many muscle fibres. Letting your elbows flare out. This takes the emphasis off your chest and cause possible shoulder injury. Jerking the weight up. Do not jerk the weight. Not only can this cause you to lose proper form and lead to injury but it also takes the resistance off the muscle and will diminish the exercise effectiveness.